Discussion in 'Guides' started by RGiskardR, Jun 2, 2018. Microsoft's Windows operating system includes a set of power options that define, among many other things, when the screen is turned off. You can configure Windows to never turn off the screen when the device is connected to a power source. If you do lock the screen occasionally or even regularly, you may have noticed that the setting is not honored by the operating system when you lock the system. 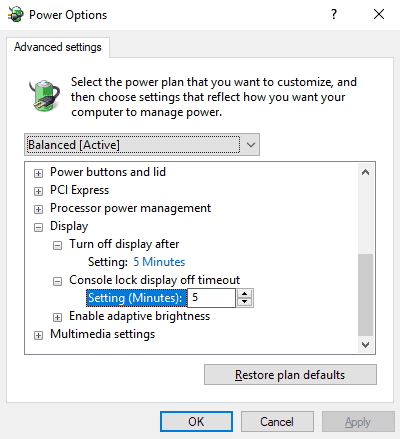 Windows turns off the display after 60 seconds when the system gets locked regardless of power settings. The display gets turned off in locked system state even if you have configured Windows to never turn off the display when the device is connected to a power source. Windows comes with a hidden option in the Windows Registry to change that. You may edit the Registry to add a new option to the power configuration so that you may change the timeout value of the display when the system is locked. You may like to see the date and time displayed by Windows on then lockscreen, get a glimpse of recent notifications, or simply check out the most recent desktop background, and that requires a different timeout setting to block Windows from turning off the screen when the account gets locked. Note: The tweak applies only to the lockscreen when a user locks the computer. It does not apply to the lockscreen on start or when a user signs out. silversurfer and Der.Reisende like this.